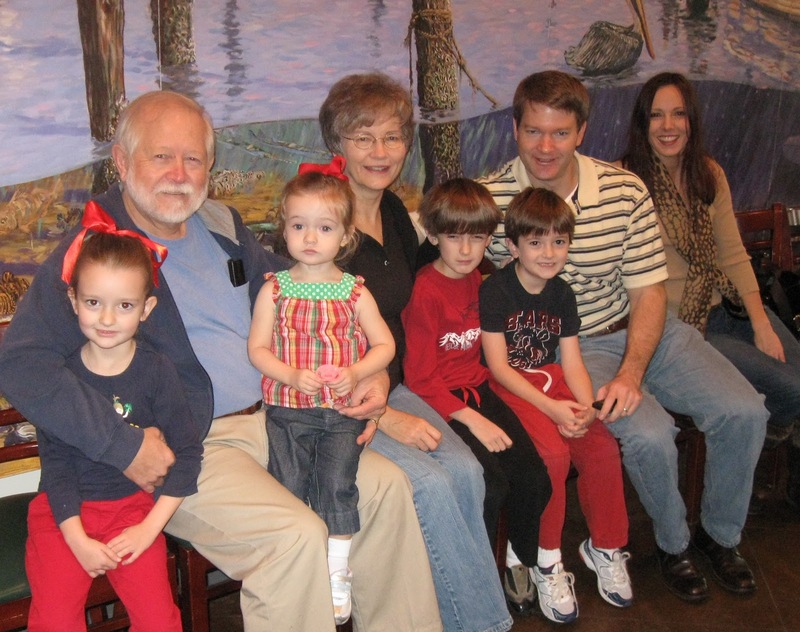 Nana and Baboo await their table at McElroy’s with eldest son Walt, wife Sarah, and their four little Skupiens. Our two sons grew up going to McElroy’s Harbor House in Biloxi, MS, for breakfast on Saturdays. The Harbor House was on the waterfront, overlooking the boat slips in the Biloxi small-craft harbor. We could watch the boats, birds and Deer Island while enjoying our breakfast favorites: the fluffy biscuits, grits, hashbrowns, bacon and eggs. Sarah was sure; she was ready for some pancakes. Her wide-eyed shock at the three giant, plate-sized pancakes that arrived in front of her instantly became part of the Harbor House lore that fueled our tradition. But the Harbor House in Biloxi is no more, swept away by Hurricane Katrina. These days, Sarah promotes tradition by getting everyone on board for a trip to McElroy’s in Ocean Springs. Our most recent outing once again involved three pancakes that practically hung over the edges of the plate. This time, however, it was one pancake each for Walt and Sarah’s three oldest children. And even six-year-old son #2, the champion pancake eater of the family, had difficulty finishing the super-sized treat, just like his mom years earlier. Ahh . . . tradition! Oh, and for the record, we didn’t introduce our second son Jeremy’s wife to Harbor House. Imagine our surprise to learn early in their relationship that she, a native of Baton Rouge, LA, already shared our enthusiasm for the original McElroy’s in Biloxi. Katie’s grandfather had included her on numerous outings to the Mississippi Gulf Coast during her early years, and the Harbor House was one of his -- and her -- favorite stops. How sad that the original place was swept away, but how wonderful that the tradition continues! I'm glad to hear that your mom is better! Oh how I wish we had one here!! There is no good place to get breakfast. Cracker Barrel, but that is not great like this. What a great picture of the family!! So many, and yet no one crying, blinking, or frowning! Guess the pancakes really are magical! Do you remember one instance at the Biloxi location when we were seated next to a mother and her mildly misbehaving child? Let me refresh your memory. We had just ordered and were enjoying the view of the harbor when we were distracted by a mother two tables over admonishing her 5 year old daughter, for what, we couldn't tell. Keeping our eyes cut to observe the goings on we could tell this was a woman of affluence due to her purse being the size of my bookbag and obviously a designer brand since we had never seen such before. After the mother had finished her disciplinary tactics and the child remained motionless and unhappy, her food arrived. Apparently the patrons that sat at the table before her didn't close the screw top to the ketchup that well because when she shook it from side to side the top came off and filled her designer purse with half a bottle of ketchup! It took everything we had not break out in hysteria. Love these fun family traditions. I think they are the glue that holds the family together. Keep doing them. Isn't it funny that Jeremy and I grew up eating at McElroys??!! My family has always said that my Papa would be so proud and happy that I married a Mississippi boy!! And I think that he'd be thrilled that we are now taking his great grandchildren to McElroys. Glad we can continue the tradition together! !